1. Penetrol: This is used to improve the flow and penetration of oil based coatings. We use this occasionally. 2. 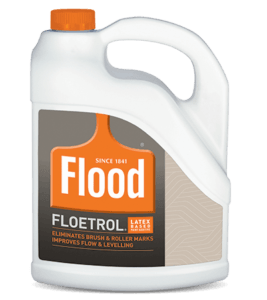 Floetrol: Basically the latex version of penetrol. Extends dry time. Brush work levels out much better. 3. Mildewcide: Added to paint to prevent mildew. Indoor and outdoor applications. When we are painting areas subject to moisture like bathrooms or maybe a musty basement area we always incorporate a mildewcide into the paint. This is in addition to using a “factory mix” bathroom paint, a coating with a mildewcide already in it. We do this to boost it a bit. When we are doing an exterior and they have areas where mildew is a problem, like soffits or shaded areas, we add it to the exterior coating as well. Floetrol is a great product. When we are going to do a lot of brush work we almost always use this. It slows the drying down enough to let the brush marks level out. Some latex products dry exceedingly fast. This will slow that down for you. Penetrol is a super product. One of the really nice things you can do with this product is pre-treat steel prior to painting. I learned this trick a long time ago. There was a long set of stairs on the side of a bank building. They were in very bad shape. Lots of rust. After cleaning/scraping/sanding them, we coated them with penetrol. Then we painted them with a good DTM (direct to metal) coating. Twenty years later they looked good! Emulsa bond is a additive we have used. It promotes adhesion and while we don’t use it as much as we use to, it is a good product and it does work. We have also used a water repellent additive before. Okon, At the request of an Architect. It gives coatings water repellent protection but how long it lasts is in question. Paint naturally has water repellency so it is hard to judge the benefits of using Okon. There are many other additives for paint. A common one you will find on or around the paint counter in the “box” stores is the scent additives. There are many types and brands of these available. We do not use these. I do not believe they negatively effect the quality of the paint but they are all rather short lived. They last a few weeks at best and if you want to use one of these, be certain you like the smell. It will be around for a few weeks. Seems pointless to me to add it to the paint for a few weeks benefit. Insecticides are also available as paint additives. We have used these and they do work but again the life expectancy is in question. There are versions that are for exterior coatings only and there are some “safer” ones you can use indoors or out. The safer ones usually use plant oils as the insecticide. All of them, the chemical insecticides and the plant oil ones, are contact insecticides. The insect must touch the treated surface for them to work. I personally don’t like the idea of using these inside my home. Safe or not. Some additional paint additives are decorative flake or quartz. Usually used on epoxy floors. Glitter for interior walls or ceilings. Like in a young girls bedroom. Non skid additives, usually quartz or aluminum oxide for floors. Texture additives for walls which is usually limestone or gypsum granules. There are fire retardant additives that raise the ignition temperature of a coating and there are Insulation additives. These are usually ceramic microspheres. The jury is still out on many of the “insulation” additives. We have used insulative paint that comes already mixed and it really does work but we must use special equipment that keeps it mixed and the microspheres in suspension so I don’t know how the additive variety would work. One of the strangest additives I’ve seen is an “ionic” additive that apparently turns your walls into air purifiers. These use negative ions to attract odors and pollutants in the air as part of the regular air circulation in a room. It is very interesting but I don’t know if they really work. There are undoubtedly many more paint additives I haven’t mentioned and each year there are new ones.